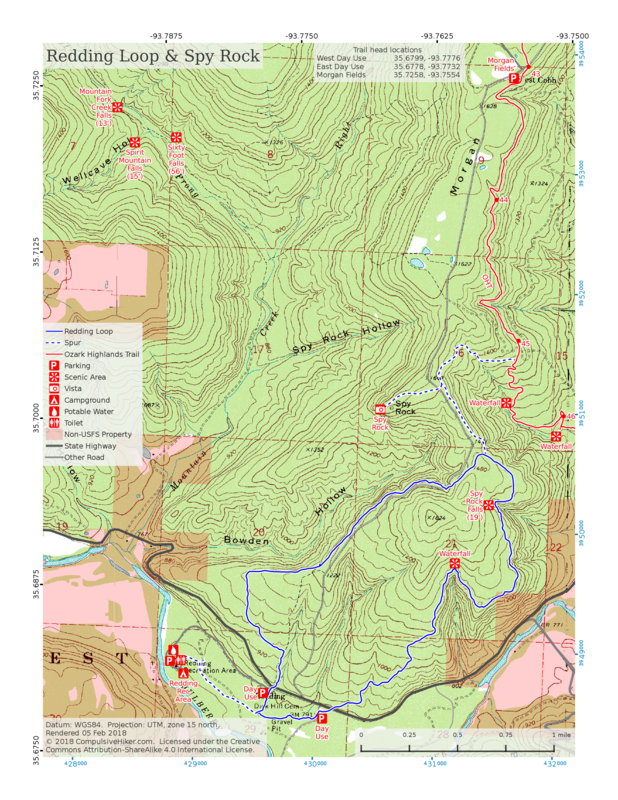 Maps: Trails Illustrated #232 & 233 (Buffalo National River). Note that map 233 shows parts of the Ozark Highlands Trail (OHT) and Buffalo River Trail (BRT) north of the Buffalo River in the Tyler Bend and Gilbert areas. These are not the OHT and BRT, it’s an old horse trail and an old railroad grade respectively. Map: Mulberry River, great for floaters and hikers. Available at Turner Bend Store, Pack Rat, and several similar locations in NW Ark. Alum Cove Natural Bridge Recreation Area. Near Deer, Ark. The main attraction here is the natural bridge but there are other rock formations. Lots of bang for the buck. 1+ mile loop. The entrance for the rec area is at 35.857787,-93.23404. May 2013 trip. Buffalo River Trail – Upper Section. 36.5 miles from Boxley to Pruitt with many in-between trail heads. OuachitaMaps.com map. The Boxley trail head is at 35.945762,-93.398655, Steel Creek Campground trail head is 36.039198,-93.346025, Kyle’s Landing is 36.05511,-93.28176, Pruitt is 36.060988, -93.139434. Other access points are the Ponca low water bridge, Erbie Campground (now a day-use area), Cedar Glade day use area, and Ozark Campground. Buffalo River Trail – Middle and Lower Section. 43 miles from Richland Creek to AR-14 (Dillard’s Ferry). Details and maps. Ponca Wilderness. Many trails. Trail head coordinates: Centerpoint is 36.064032, -93.360395, Compton is 36.081231,-93.303185, Steel Creek Campground is 36.039198,-93.346025, Kyle’s Landing is 36.05511,-93.28176. Some of the trails are Centerpoint, Sneed’s Creek, Hemmed-in Hollow, Chimney Rock, Bench, Old River Trail, Indian Creek. Upper Buffalo River Wilderness. Details and maps. Lower Buffalo River Wilderness. No official hiking trails, but miles and miles of illegal horse trails. I have a 4-page set of maps that will be 1:24000 scale when printed at 11×17″. Included is the route of a proposed extension of the Buffalo River Trail. Other trails in the area. Hideout Hollow, Cecil Cove, Lost Valley, Farmer, Goat Bluff, Mill Creek, several at Tyler Bend, Gilbert Railroad, Indian Rockhouse, Rush Mountain. Butterfield: a 15 mile loop, mostly in the national forest outside the park boundary. No primitive camping within park boundary. OuachitaMaps.com map. Get a free permit at the visitor center. Yellow Rock: 3 miles. One way or round trip? I don’t know, probably round trip. Fossil Flats: primarily a mountain bike trail? Devil’s Den: A short trail with much interesting geology. East Fork Wilderness. 10,777 acres encompassing the upper watershed of the East Fork of Illinois Bayou. No official trails but there are old roads commonly used as such. The Overcup access point at 35.58821,-92.914778 on the west side of AR27 doubles as a scenic overlook area for the Middle and North Forks of Illinois Bayou. There is a trail head sign on the east side of the highway. The Sycamore Creek access point on the east side of the wilderness is at about 35.587951,-92.830625, with a large parking area on the east side of the road and the wilderness on the west. The Dean Ridge access point is also on the east side. You leave the road (heading west) at 35.556572,-92.842874 and drive .6 miles across a pasture (private land) before crossing into the National Forest, with a parking area and the wilderness somewhere beyond. I became concerned about the road conditions and didn’t get all the way in here. A pickup truck or Jeep kind of vehicle might be required. The Ozark Society has a nice map which you can get here, or maybe other places. Here’s my map of the entire wilderness area plus some interesting stuff to the south – at 1:24000 on 11×17 paper. Solo and Lost Corner quads. Jan ’15 trip. Glory Hole. About 2 miles out-and-back. Located near Fallsville, Ark, the Glory Hole is where Dismal Creek pours through a hole in the roof of a large rock overhang. Pull off AR 16 at 35.82844, -93.39073 and park up along the highway and walk down. Don’t be one of the assholes that tries to drive all the way down. May ’13 trip. Hurricane Creek Wilderness. See also Ozark Highlands Trail, section 6. Nov ’12 trip, Oct ’15 trip. The Ozark Society publishes a nice map of the area. Here’s my map of the entire wilderness area – a 2-page PDF at 1:25000 on 11×17 paper. King’s River Falls. About 2.5 miles out-and-back. Located north of Boston, Ark. There is off-road parking at 35.89448, -93.58497 and a sign for the Kings River Falls Natural Area. May ’13 trip. Lake Alma Trail. 3.8 mile loop on the north side of Alma Ark. The trail head is in the parking lot at about 35.496820, -94.217423. On the far (west) side of the lake, the nice single-track-in-the-woods gives way to old double track and the woods diminish, then disappear entirely on the long walk across the dam and back to the parking lot. Lake Wedington Trail. 15.4 miles out-and-back. Located west of Fayetteville in the Wedington Wildlife Management Area. Trail head is on the north side of the road at 36.091647, -94.374988, Lake Wedington Recreation Area is on the south side. The trail heads north to the top of the northern pair of the Twin Mountains, overlooking US-412. There is a spur that goes east down to the Illinois River. Feb ’14 trip. Leatherwood Wilderness. 16,900 acres of goodness in the Sylamore area. East of and adjacent to the Lower Buffalo Wilderness. There are no official trails but there are old roads commonly used as such and many illegal equestrian trails. Here’s my map of the entire wilderness area – a 2-page PDF at 1:25000 on 11×17 paper. The Sylamore section of the Ozark Highlands Trail runs along the south and east sides. Lost Valley Trail. 2.3 miles out-and-back. Located in the Lost Valley State Park between Boxley and Ponca in Buffalo River country. Turn from AR43 at 36.0075, -93.3661. Lots of bang for the buck. Part of this Oct ’12 trip. Moccasin Gap Trails details and map. North Sylamore Creek Trail. 23 miles point-to-point. Located E of Marshall, N of Mountain View. OuachitaMaps.com maps. This is like the Buffalo River on a smaller scale – lots of bluffs, scenic vistas, interesting rocks, and swimming holes. The west trail head (Cripple Turkey Road a.k.a. 91079A) is at 36.056545, -92.318443 and is a junction with the Sylamore section of the Ozark Highlands Trail. The east trail head (Allison) is about 35.942063, -92.12675. Other trail heads in between are Barkshed at 36.019086, -92.251092, Gunner Pool at 35.994099, -92.212329, and Blanchard Springs at 35.969741, -92.172992. making for very convenient day-hikes and section hiking. June ’11 trip. April ’12 trip. March ’17 trip. Ozark Highlands Trail details and maps. Pedestal Rocks & Kings Bluff Trails. 2.2 & 1.7 mile loops in the Pedestal Rocks Scenic Area. Scenic indeed – interesting rock formations, a big waterfall, and great views of the Illinois Bayou watershed. Trail head coordinates are about 35.723906, -93.015887. May ’13 trip. Penhook Special Interest Area. The home of 41′ Penhook Falls and at least 8 other waterfalls. A few miles north of Hector AR, north/west of AR-27 on FR 1376. Main parking area is at 35.560079, -92.947969. If you can’t get across Snow Creek then park at 35.552340, -92.948705 and continue on the road .5 miles on foot. Dec ’15 trip. Redding Loop & Spy Rock. 7.25 miles round-trip located north of Ozark, Ark. Park near the Redding Recreation Area. Free day-use areas are right where you turn off AR-215 at 35.6799,-93.7776 on the west leg of the loop and a larger lot at 35.6778,-93.7732 on the east leg. There is a 0.54 mile spur from the campground. Another spur at the north end of the loop intersects the Ozark Highlands Trail at about mile 45.2. Great scenery and a great place for a picnic. Here’s my topo map, scaled at 1:24000 on 8.5×11 paper. Sep ’13 trip. Richland Creek Wilderness. No official trails, but there are well-worn paths to the 2 most well-known features – Twin Falls and Richland Creek Falls. The Richland Creek Campground is adjacent to the wilderness at the confluence of Richland and Falling Water Creeks. Turn west from FR 1205 at 35.796435,-92.930315. A small length of the Ozark Highlands Trail runs parallel to FR1205 on the east side. The Ozark Society publishes a nice map of the area. Here’s my map of the entire wilderness area – a 2-page PDF at 1:24000 on 11×17 paper. Oct ’12 trip. Sam’s Throne. Located south of Mt Judea, Ark. Best access to the area is via the Sam’s Throne Campground (vault toilets, no water, primitive sites) – exit AR 123 at 35.879036, -93.04474. At the end of the campground road are three openings in the fence leading out to different parts of the rim. The path to get below the bluff is neither marked nor obvious but can be found using this map showing roughly where some of the paths are. Sep ’14 trip. Shores Lake Loop (aka White Rock & Shores Lake Loop). 12 mile loop located NE of Fort Smith. A short section of the loop is shared with the Ozark Highlands Trail. The south trail head is in the Shores Lake Recreation Area at about 35.643495, -93.962433 ($3/day parking). The north trail head is in the White Rock Mountain Recreation Area on top of the mountain at 35.68953, -93.95447 with a 0.3 mile spur down to the loop. The trail elevation ranges from about 670′ in the south to about 2100′ in the north, and 2280′ if you take the spur up to the top of the mountain. The top features the Rim Trail – a very scenic 2.2 mile loop that makes a nice addition to the Shores Lake Loop. OuachitaMaps.com map. Dec ’12 trip, Jan ’15 trip, May ’17 trip. Smith Creek Preserve. Property is owned by The Nature Conservancy – one of my favorite conservation organizations. Located south of Boxley off AR-21. Parking is at 35.9344, -93.3858. Several trails can be combined. Smith Creek Road (0.95 mi), Big Spring Trail (0.98 mi), Lower Trail (1.49 mi), Upper trail (0.95 mi), Elise Falls Trail (0.65 mi). Map (1:18000 scale on 8.5×11 paper). Feb ’17 trip report. 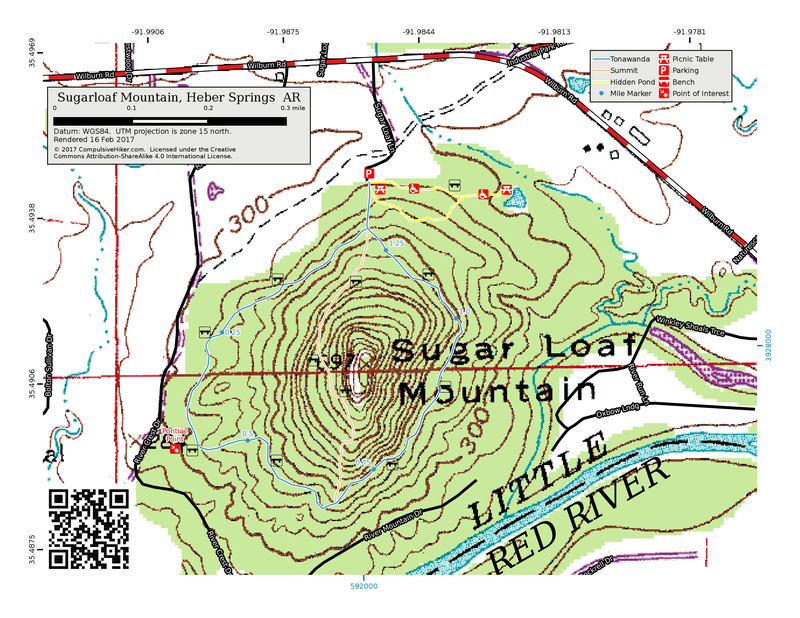 Sugarloaf Mountain (in Heber Springs – not the one in Greers Ferry Lake). Parking at 35.494534, -91.98555. The Tonowanda Trail is 1.2 miles and goes around the base of the mountain. The Summit Trail is 0.4 miles and goes over the top but at the base of the bluff. The Hidden Pond Trail is about 0.4 miles and wheelchair accessible. Map (1:6000 scale on 8.5×11 paper). Jan ’17 trip report. Whitaker Point (aka Hawksbill Crag). The trail head is at 35.8982,-93.4581 on Cave Mountain Road. This place is a zoo on weekends and a great example of an area being loved to death. 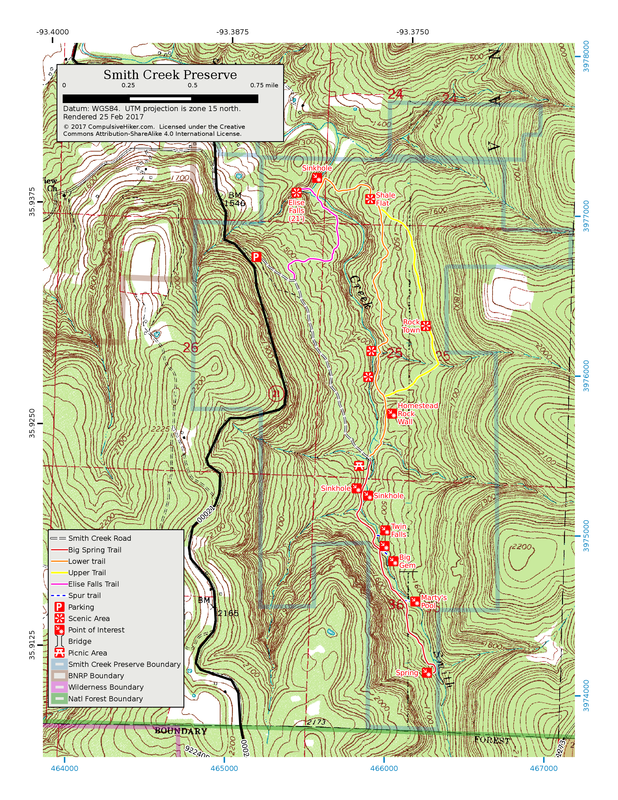 Located in the Upper Buffalo Wilderness – near the top of map 2. Part of this Oct ’12 trip.